(5 Customer Reviews) | Write Review 13 issues per year Psychologies is the only women's glossy magazine that aims to address what we're really like, not just what we look like. If you're interested in intelligent topics like behaviour, personality and how the huge changes happening in the world of work, consumption and social media will affect you, this is a must-buy. We keep up with the latest psychological research and trends, use great writers, seek out expert opinion, and give well-supported advice. We also have a strong ethos of positivity, in interviews, health, wellbeing and beauty. Looking for Psychologies in print? 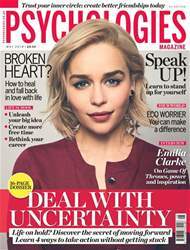 Unfortunately pocketmags.com does not sell print copies of Psychologies, but all is not lost. Our partner at magazine.co.uk sells print subscriptions at the best prices online. Psychologies is the only women's glossy magazine that aims to address what we're really like, not just what we look like. If you're interested in intelligent topics like behaviour, personality and how the huge changes happening in the world of work, consumption and social media will affect you, this is a must-buy. We keep up with the latest psychological research and trends, use great writers, seek out expert opinion, and give well-supported advice. We also have a strong ethos of positivity, in interviews, health, wellbeing and beauty. You'll receive 13 issues during a 1 year Psychologies magazine subscription. I get it every month and have bought some back issues too, really lovely magazine - honestly have learned a lot from it & always enjoy reading it! Excellent magazine with a lot of different articles about different life's issues. You can gain a lot of knowledge from it regardless of what level you are at in Psychology. This magazine is my favourite and have been reading it for years. It helps with different life issues with well-written and intelligent articles. A positive read that represents real women and real issues. Really good magazine it has got lots of different articles about different life's issues. One can gain a lot of knowledge from it. 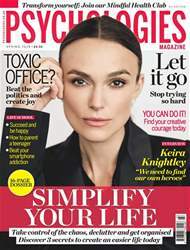 Below is a selection of articles in Psychologies Spring 2019. 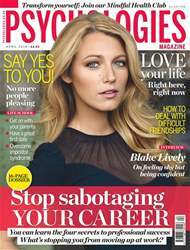 You'll receive 13 issues during a 1 year Psychologies magazine print subscription.